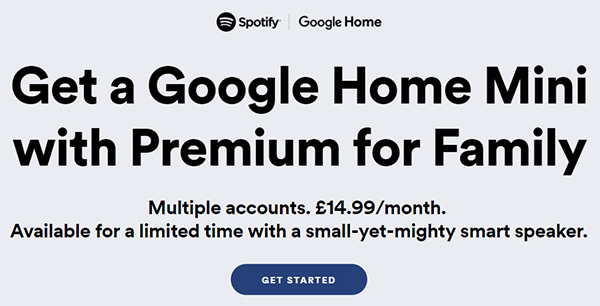 When you navigate to Spotify website for family part in the UK, a big banner will come to your eyes saying 'Get a Google Home Mini with Premium for Family'. Yeah, after Spotify gave away a free smart-yet-mighty Mini smart speaker in the US last year, this offer is no available for UK subscribers. That's to say, Spotify offers a free Google Home Mini speaker to its UK subscribers now. For more detailed info about this good news, please read on this article. Spotify offers three tiers for users to discover and explore music entertainment, respectively Spotify Free, Spotify Premium as well as Spotify Family Premium. As for the plan of Spotify family premium, it costs £14.99 per month and allows to listen to Spotify music and playlists with multiple account, which is available for up to 6 people living in the same address. With Spotify Premium subscription, you will be able to enjoy the offline playback feature, allowing to download songs and playlists for offline listening and stream ad-free and high-quality music to other devices via Spotify Connect. You can enjoy the Shuffle play and unlimited skip features as well. Who/When Can Get Google Home Mini with Spotify Family Premium? 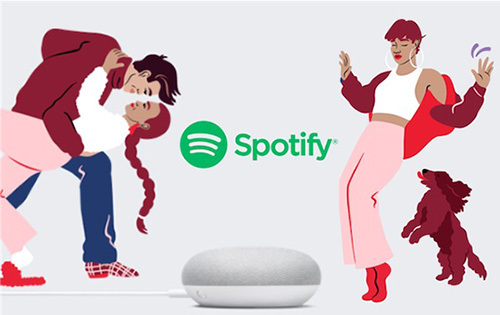 No matter you are new or existing Spotify subscribers with family premium plan, you can redeem a free Google Home Mini online if you are the master account holder. But please make sure you are an UK user as this promotion activity is available in the UK only. The good news is that Google Assistance on Mini speaker can recognize the whole six voices living in the UK address. Although this offer ends on 14 May 2019, you can redeem Google Home Mini by 24 May 2019. So please don't miss the right time. The effective way is to get this smart speaker on hand only if you are subscribing Spotify Family Premium. Apple only sent a wave of Apple Music notification to current subscribers and allows them to gift a free month of the service to their friends. If you don't receive such notification from Apple or your friends, what should you do? Step 1. Open Spotify and log into your Spotify account with Family Premium plan. Step 2. Go to the redeem page by typing 'spotify.com/googlehome/redeem'. Step 3. Choose the favorite colour of Mini speaker that you'd like to use and click 'Buy' to fill the info. You can access to Spotify tracks on Google Home Mini via Bluetooth with ease. But if you have cancelled this subscription, you will loss the right to access to music from Spotify on Google Home. Therefore, is there the any way to get Spotify Family Premium for free forever on Google Home? Fortunately, the answer could be positive! To achieve this goal, you can refer to the detailed introduce to get Spotify Premium free forever or just download AudFree Spotify Music Converter to take you out. It's one of the professional music converters for Spotify, which can download and convert Spotify music to MP3 and other files with lossless output quality preserved. After that, you can transfer Spotify music to Google Play Music for playing on Google Home without problem. Just have a try of this free trial version to see whether it could meet your needs. When you receive Google Home Mini, please don't miss that it comes with a free three-month trial for YouTube Music Premium, which also allows you to access to Google Play Music with no cost. Besides, although only UK subscribers can get this offer, US users can access to Hulu videos for free if you subscribe Spotify Premium for $9.99 every month. Now for what to do? Just subscribing Spotify Premium Family plan, so that you can redeem Google Home Mini and enjoy so many amazing features with Spotify and Google Home.